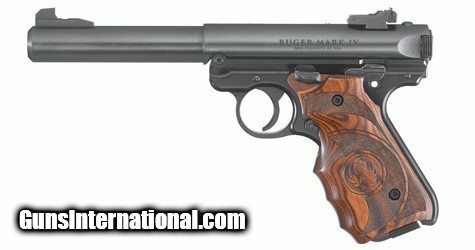 Ruger's Mark IV Target Pistol is a simple, one-button takedown for quick and easy field-stripping and proper chamber to muzzle cleaning. A recessed button in the back of the frame allows the upper receiver to tilt up and off of the grip frame without the use of tools. 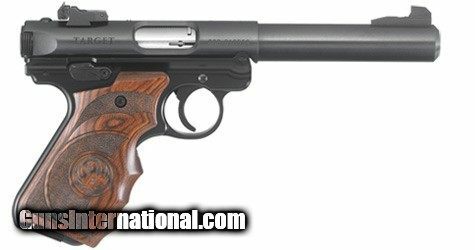 It features an one-piece, precision CNC-machined aluminum grip frame, ergonomic bolt stop, a contoured ejection port and easy-to-grasp bolt ears allow for durable and reliable operation round after round. Smoothly contoured wood laminate target grips with wrap around finger grooves for precision shooting. The accurate sighting system features adjustable rear sight and drilled and tapped receiver for Weaver- or Picatinny-style rail for easy mounting of optics. Ambidextrous manual safety positively locks the sear in the "SAFE" position when applied.